BRISTOL - The Futures Collegiate Baseball League truly resembles its name. Across the seven teams competing in the league, there are players of all different levels and ages. 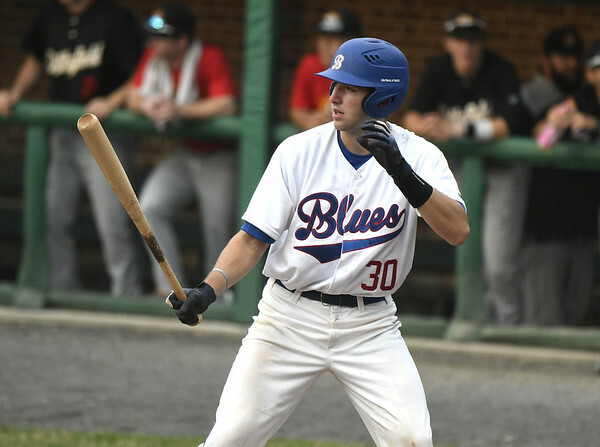 On the Bristol Blues’ roster, four recent high school graduates are hitting in some of the most critical spots in the order. Justyn-Henry Malloy (Vanderbilt University), Emmet Sheehan (Boston College), Patrick Winkel (UConn) and Jimmy Sullivan (University of Virginia) have all produced for Bristol this season. Winkel, Sullivan and Malloy have all hit near the top of the batting order and have had roles in winning games this season. Winkel is hitting .262 in 42 at bats, Malloy is hitting .259 in 54 at bats and Sullivan is batting .188 in 16 at bats. While the marks are average in terms of the Bristol lineup, evaluating the three hitters based upon batting average isn’t as important as the number of plate appearances. Sheehan is the only pitcher at that age level, but has also been one of the most dominant Bristol pitchers this year, showcasing why he’s Boston College-bound and going to be pitching in the Atlantic Coast Conference. In 23 innings pitched, Sheehan has a 2.34 ERA, fourth best on the roster and the lowest ERA for a pitcher with the number of innings that Sheehan has thrown. He’s flashed dominant stuff on the mound and will be a key piece if Bristol makes a championship run. While looking at the numbers is one thing, just getting in reps on a regular basis is something that makes the Futures League extremely valuable, especially for players such as the four future freshmen that are preparing for Division I baseball. Posted in New Britain Herald, Bristol Blues on Monday, 9 July 2018 21:08. Updated: Monday, 9 July 2018 21:10.